Join the discussion on our forums! 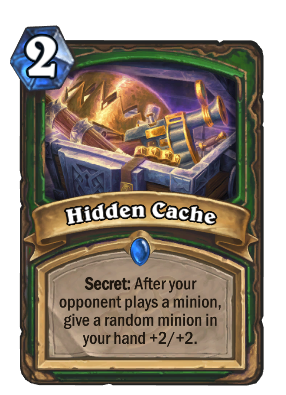 Come discuss Hidden Cache over in our dedicated Hidden Cache discussion topic. Secret: After your opponent plays a minion, give a random minion in your hand +2/+2. There is an urban legend that the first Toxic Sewer Ooze was born because a rookie Goon stashed an open container of milk in a Hidden Cache. Look! The false teeth of Grimscale Chum in a chest! Avenge is far better and costs only 1 mana. So bear trap gives a 3-3 with taunt, snake trap 3 1-1s, cat trick a 4-2 with stealth and this...is totally unplayable, what were they thinking? i kinda like this card. sure its trash,but its a secret. and say if you played snipe earlier and you play this,then this fucks with your opponents head SUPER hard. Yeah i think blizzard just decided that hunter does not need a new secret so they printed this card. 1. Why is this card a secret? I can't see a good reason. Al'Akir the Windlord is the best possible target ever (extremely unlikely, akin to impossible scenario), otherwise, it's kinda trash. It's not impossible. Play shaman with Al'Akir, Yogg can get you this secret. Or play as hunter, play Yogg when your opponent has Al'Akir out, Yogg gives you two mana via innervate, and casts shadow madness on Al'Akir. Then you play brewmaster on Al'Akir... Clearly a synergy worth building a deck around! Is this really legit? The artwork is terrible. It looks blurry like it's zoomed in on a small part of a bigger piece. Thanks! I realized after posting this that all the latest cards were blurry and assumed it was something like this.